AKA James Francis Byrnes, Jr.
James F. Byrnes was elected to seven terms in the US House of Representatives as a Democrat, losing his seat in 1924 when his opponent smeared him for his refusal to join the Ku Klux Klan and, perhaps worse in his time and place, having been born into a Catholic family. 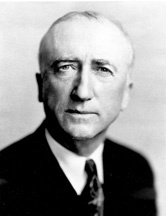 Still, with the support of millionaire Bernard M. Baruch, he was elected to the Senate six years later, and despite his reputation as a fiscal conservative he became an ally of President Franklin D. Roosevelt and supported most aspects of the New Deal. As World War II loomed in Europe, Byrnes shepherded Roosevelt's legislative agenda through the Senate, including repeal of the Neutrality Acts, and in 1941 -- mere months before Pearl Harbor -- Roosevelt rewarded Byrnes with an appointment to the Supreme Court. After only one term on the high court, Byrnes resigned to take what became an even more powerful post. Officially titled first as head of the wartime Office of Economic Stabilization, and then Director of the Office of War Mobilization and Reconversion, Byrnes' responsibilities were sometimes summarized as "President for domestic matters". He had effective control over virtually all wartime domestic matters from food rationing to wage controls, allowing Roosevelt to concentrate on prosecuting the war, and he was seriously considered for the Vice Presidential slot that went instead to Harry S. Truman. After Roosevelt's death, Byrnes was appointed Secretary of State by President Truman, and advocated the use of atomic weapons against Japan. After leaving Washington, Byrnes was elected Governor of South Carolina, and in 1952 he became one of the first prominent Democratic officeholders to break with the Party over racial politics, endorsing the Republican Presidential candidate, Dwight D. Eisenhower. When the Supreme Court's 1954 ruling in Brown v. Board of Education outlawed "separate but equal" public schools, Gov Byrnes publicly called for "massive resistance" to integration. After leaving office he left the Democratic Party and re-registered as a Republican. He campaigned for Barry Goldwater in 1964, served as senior advisor to Richard M. Nixon's 1968 campaign, and helped implement the so-called "Southern strategy" that made the South solidly Republican in modern times. Held office as a Democrat, but became a prominent Republican Party leader in retirement.